Home Tags Articles tagged with "manufacturing"
Arizona lost 7,200 nonfarm jobs from April to May, but the state’s unemployment rate dropped from 4.9 percent to 4.7 percent. The Arizona Office of Economic Opportunity released the jobs report Thursday. Compared to May 2017, the state added 70,700 total jobs. Economist Adam Turk said manufacturing, education and construction were drivers in job creation in May. “Building construction recorded its largest over-the-year gain in nearly 12 years,” Turk said. There were 5,100 jobs added in the subsector of building construction, a 17.8 percent increase. In particular, the construction subsector of specialty trades saw job growth up 9.1 percent compared to last May. In the United States, that number is 4.2 percent, reflecting the increased construction activity in Arizona. Manufacturing has seen a recent upsurge in hiring. Overall, the sector grew 5.5 percent since last year and 1.3 percent since April. That is an increase of 8,900 jobs, the largest gain in 20 years. Turk said manufacturing of computer and electric parts – “a sector where we, for the past several years, have seen job losses month over month” – has turned around since the final quarter of 2017 to post job growth. Its year-over-year increase was 9.7 percent. The education and health services sector grew by 14,100 jobs over the year, the biggest increase in the state. Turk said that was primarily driven by additional education hires, possibly due to the state’s new education budget. In Pinal County, the biggest employers were in the service industries, though that showed a month-to-month loss of 50 jobs. A number of sectors were down slightly in May compared to April, including manufacturing, business and professional services, hospitality trades and trade, transportation and utilities. Construction jobs increased in Pinal County, as did government jobs and education. 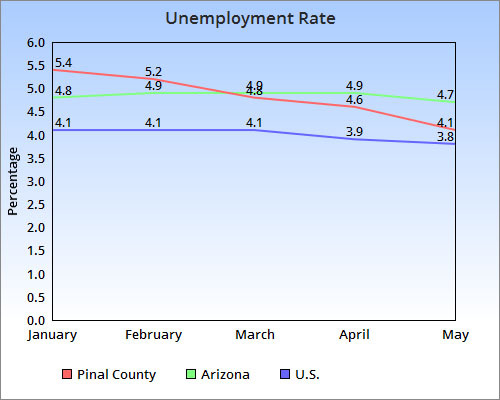 Overall, the county’s unemployment rate dropped from 4.6 percent in April to 4.1 percent in May.